Terry and Sheila Carter returned to the TRNC for a holiday and to also accompany the Royal British Legion, Kyrenia Branch on the trip to Gallipoli, Troy and other places in North West Turkey which had been arranged earlier in the year. Terry and Sheila departed from the TRNC in July to take up a new life in England so it was nice to meet up with them again. 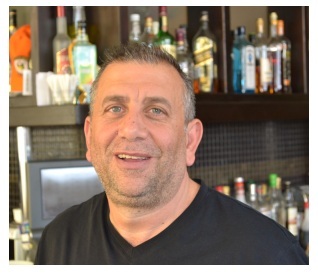 arranged a get-together for their boss and founder of 112/CESV volunteers at Café George in Girne but unfortunately Terry developed a problem with his eyes and had to leave early. 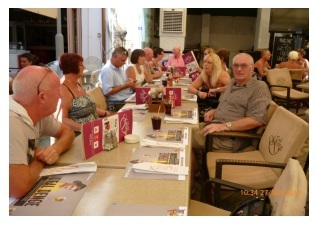 As Terry and Sheila were back in the TRNC for a short while it had been decided to hold another get-together and this was held again at Café George on the 27th September where around 20 people gathered for lunch. Chris Elliott had attended the previous lunch which was held at Cafe George in the plaza area and he wrote an article about the event saying that lots of orange tee shirts appeared worn by the CESV volunteers who had all arrived for a lunch date and that they were there to say thank you to big hearted George “Ali Ferhatogluları” the owner who had arranged for the supply of 50 new caps for the CES(V) Search and Rescue Volunteers. This time there were no hiccups and it was an extremely nice social gathering, Café George did us proud with the lunches which we had chosen from their very extensive menu and before long we were all tucking into the really good food and catching up with news from each other. As the afternoon went on and people were starting to leave we said our farewells to Terry and Sheila who said they will be back again in May next year to catch up with all the friends and acquaintances they had made during their years in the TRNC.